Since I posted about the complimentary cleansing oil and some girls are afraid it might not be true or that the SA at Shu Uemura won't give it out (snobby/etc) or WORST maybe I'm telling April Fool's joke here? yeah so I decided to show u all that it's really much "kisah benar" (true story) and this is my experience redeeming the cleansing oil from Shu Uemura 1 Utama. I brought my print out of the coupon/poster above to Shu Uemura 1utama today (Friday) at 1.00p.m. The boutique manageress Lavinia (a friendly and smiley girl) greeted me and ask Christine (a newbie SA at Shu Uemura 1U) to go get the 20ml Cleansing Oil for me. I need to write my name, contact and nric on the coupon too. Before she can freely give me the complimentary cleansing oil, she has to show me how to use it first. I know how to use but well, let's follow the rules of the coupon yap! OMG WHAT IS HAPPENING TO MY HAND? OK don't worry if you don't know how to use this thing! coz they're going to teach u at their special washing basin (sink) ! it's really easy actually! 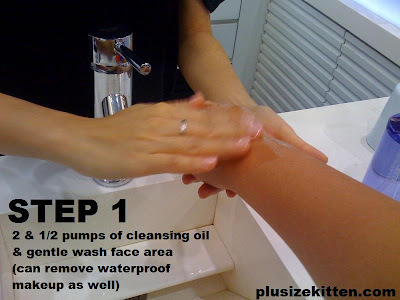 Christine told me to pump 2 1/2 cleansing oil onto my palm, then with it wash my face gentle. Can remove waterproof mascara/make up as well. Of course at the shop, they're demo-ing on your hand not your face. After that, wash with water, gently emulsifying the cleansing oil into milky water for cleansing face. You need to wash with water 5 times to remove all make up residue yeap! tadaah!! I got mine today!!! did u get yours yet? Then Christine dry off my hand and gave me the 20ml cleansing oil! ^__^ the process takes about 5-10mins depending on explanation & questions that u might ask. You can feel the skin is clean & soft after the cleanse. 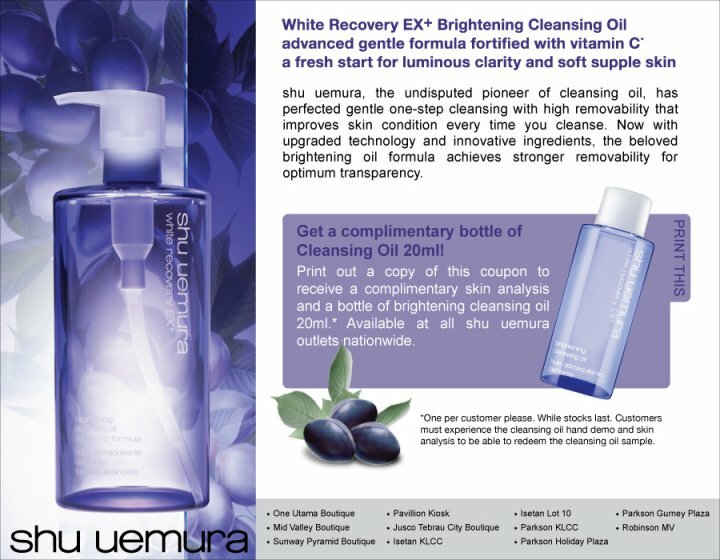 Shu Uemura has different types of cleansing oil to suit your skin concern. You can check it out there when you're doing this demonstration. Don't be SHY about redeeming samples! without the samples you won't know if it's suitable for you! (try b4 u buy). It's an even bigger problem if you pay RMXXX for products, go home 2 use it and the next day a big bad mushroom grew on your face and your modeling career hancur (destroyed). Then got lawsuit lah, Consumer tribunal lah..etc.. so headache problem so better TRY b4 U BUY! 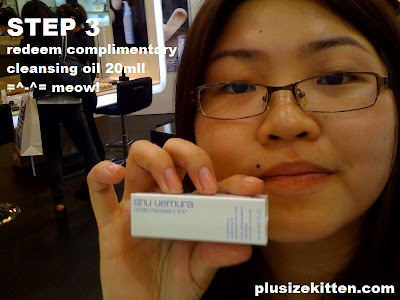 plus.. u will finally know why ppl like shu uemura cleansing oil. Nice~! glad that you go spy for us hehe, later after working hour gonna try my luck to redeem the complimentary cleansing oil~! pinky: hahha must show the fei mao go mah hahah.. good luck! let us know if u redeem liao! i have a weird feeling about using cleansing oil since i got quite an oily skin, is it moisturized your skin as well??? wow then u n hanna same skin type! i remember her buying the pink one (which is for oily skin). The pink one is Fresh (cleansing oil). shu uemura cleansing oil once emulsifies, it won't be oily anymore, and with the 5 times cleanse, u don't have to worry if it makes your skin oilier. pinky: they r so nice.. the 20ml no more, the boutique manageress give u 8ml x 3 for u! extra 4ml pulak tu! varn: omg? who is it? 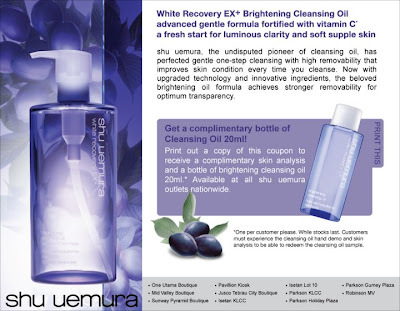 am soo happy to buy the shu uemura white recovery EX cleansing oil off from you! only left with few more drops from my oil bottle..
eventhou i wear makeup daily..150ml bottle goes a long way..last me a good 4 months! fiseel: gosh :( must be a hit.... on friday, they replaced it with 8ml bottles instead coz the 20ml out of stock. I've seen people using clarins, clinique, dior, chanel, shu and other high end brands and their face condition arent good. So you must hit the right combination. So, I'm curious about what products(for skincare routine) have you used then till now and your skincare regime morning and nite? want to look at each pros and cons of each products. tia: different skincare works for different people, one brand could be great to person A but not to person B. Ultimately, it boils down to the skin type and skin concerns one is looking for and the results they want to achieve from using it. sometimes SAs will give me a look and also sometimes we do not know if they still have stock or not but they'll simply say run out of stock if they think we look cheapo. you and another reader commented SAs in 1Utama was nice and friendly but when i went there it wasn't the same, i waited for 20 minutes while the SA (don't know her name) was serving 2 customers who were purchasing produts, when it was my turn she told me they ran out of stock after i waited that long. so i try my luck at MidValley again, they still have stock and this time the SA was really nice and friendly. sometimes very sien wan redeem samples, why these SA so lanci... your company run this promotion, it's not like the samples are coming from your own pocket.